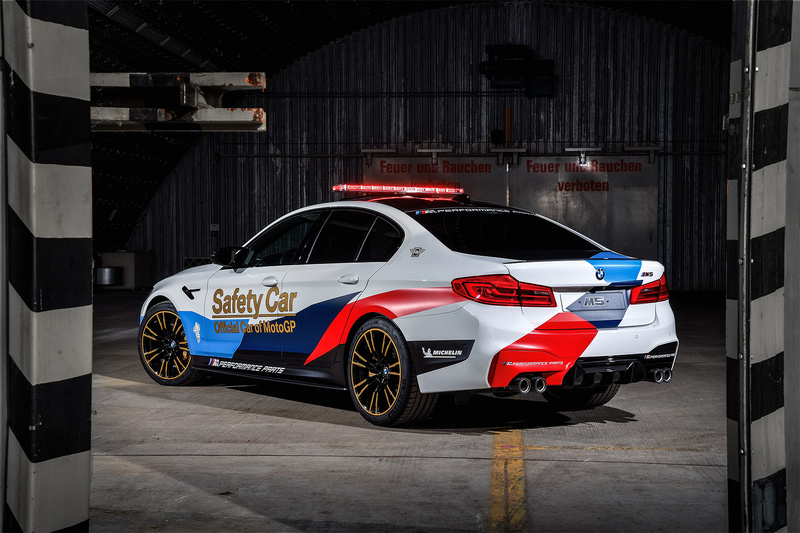 BMW has created the latest safety car for the MotoGP motorcycle racing series. The new course car is based on the all-new 600 hp all-wheel drive M5 road-going sedan. 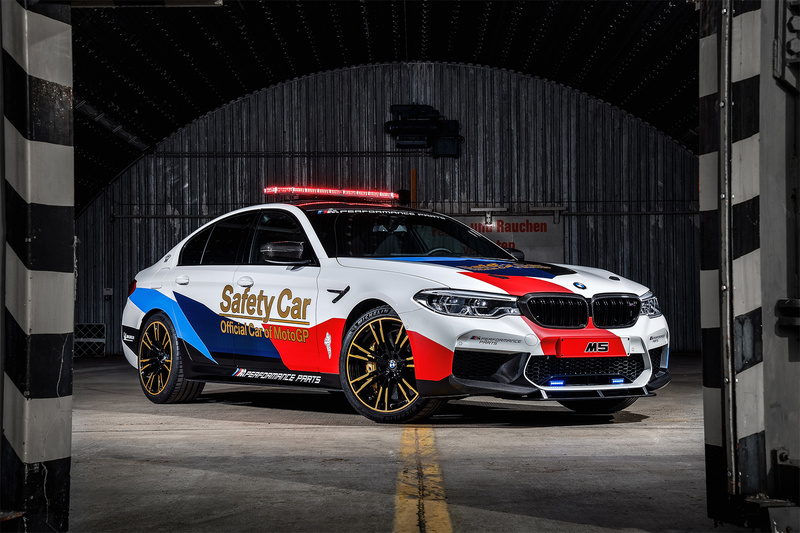 The new M5 MotoGP Safety Car will debut at the MotoGP season finale in Valencia, Spain November 10-12 and will spearhead the Safety Car fleet in the 2018 season. Some of the BMW M5 features include the newly-developed M-specific all-wheel drive M xDrive, which is being used in the BMW M5 for the first time. With precise handling and perfect traction, this guarantees optimised driving dynamics in all manner of situations. The heart of the BMW M5, the 4.4-litre V8 engine with M TwinPower Turbo technology, has been completely overhauled by the M engineers. It represents another significant increase in performance compared to previous models, with 600 hp and maximum torque of 553 lb-ft in the production M5. The new BMW M5 only needs 3.4 seconds to accelerate from 0 to 100 km/h. Transmission is provided by the new eight-speed M Steptronic gearbox with Drivelogic. The chassis contains M-specific kinematics and elastokinematics elements that contribute to optimised driving dynamics. The weight also plays an important role in performance. This has been reduced further through features such as the lightweight carbon fibre-reinforced plastic (CFRP) roof. 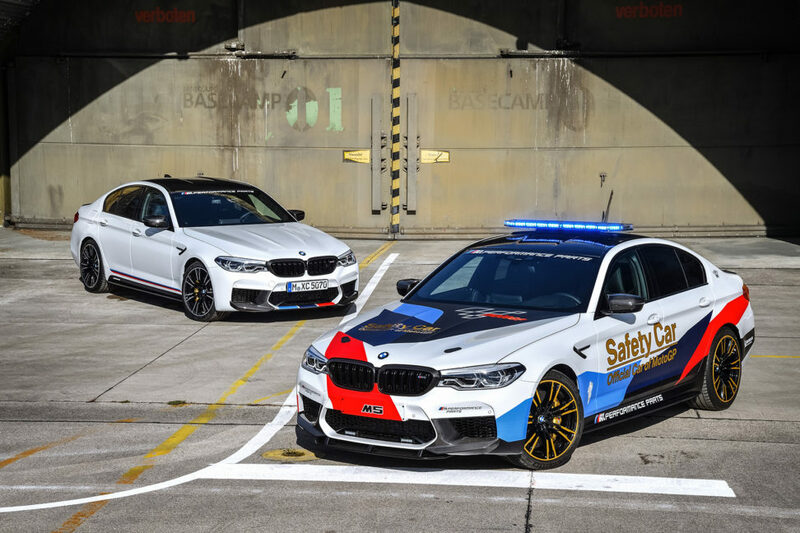 Work at BMW M Manufaktur in Garching converted the base car into the BMW M5 MotoGP Safety Car, preparing it to appear as the course car in the world’s fastest motorcycle racing series. This process included the addition of numerous BMW M Performance Parts, many of which are available as retrofit parts for the BMW M5 production model. These emphasise the sporty appearance of the Safety Car and meet all the functional requirements for aerodynamics, cooling and lightweight construction. These include various carbon components such as side sills, rear diffuser, rear spoiler, front kidney grille, door mirror caps and air breather slats. 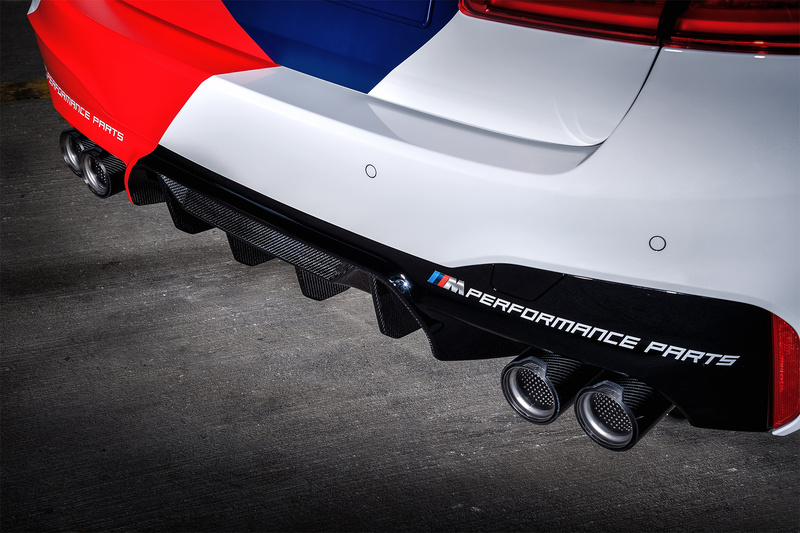 The BMW M Performance sport exhaust system is made of titanium, with carbon exhaust tips, and has been designed especially for use on the racetrack. The transformation of the BMW M5 to a MotoGP Safety Car was completed with the addition of special racing features and necessary safety equipment. 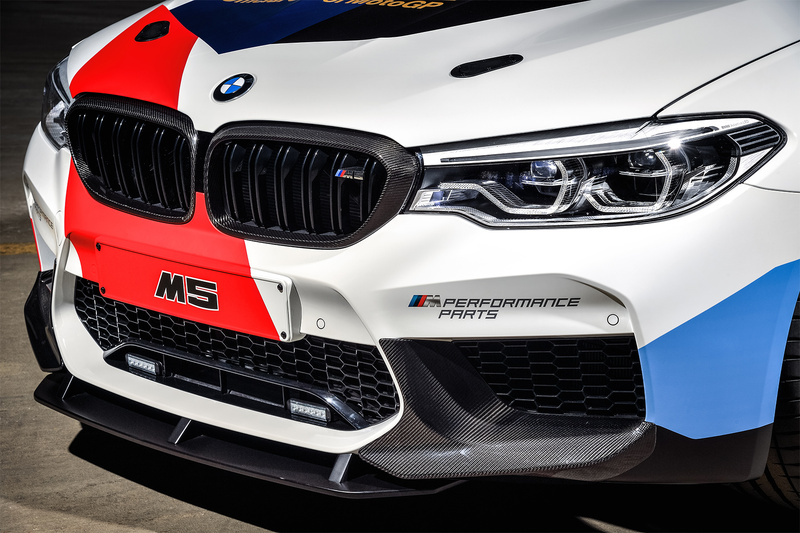 The front splitter is a prototype developed specifically for the BMW M5 MotoGP Safety Car. The hood latches are taken directly from racing. The bucket seats from the BMW M4 GTS provide a combination of comfort and maximum security for their occupants when driving on the racetrack. The flat light bar on the roof uses modern LED technology. It is controlled via a specially-developed cockpit panel. Another important signalling system is provided by the flashing front lights, consisting of blue LED lamps in the front grills and flashing corona rings for the headlamps. The partnership between BMW M GmbH and Dorna Sports, the commercial rights holder of MotoGP, dates back to 1999. The provision of the BMW M fleet is the core of the involvement as “Official Car of MotoGP”. There are also a host of other activities. The BMW M Award for the best MotoGP qualifier has been presented at the end of every season since 2003. The BMW M MotoGP Experience gives visitors the chance to experience the MotoGP at first hand. The BMW M MotoGP experts give them exclusive insights. On selected Grand Prix weekends, the BMW M GmbH presents its newest models and products.